Holiday Tree Lighting Ceremony: 6:00 p.m.
Choral Performance, Sacred Heart Show Choir: 6:15 p.m.
Choral Performance, Cathedral City High School, 4:00 p.m.
Choral Performance by Cathedral City High School: 4:00 p.m.
Santa’s Christmas Buffet: 8:00 a.m.-11:00 a.m. – A favorite holiday tradition, as Santa makes the rounds each hour. Guests are invited to stop by and take a picture with him — or tell him about those last minute gift ideas they’ve been dreaming of. Gingerbread House Decorating: 11 a.m.-3:00 p.m. (reservation required, please call 760.773.4649) – The presents are opened, the family’s all here, now gather together gingerbread decorating and good cheer! Horse-Drawn Carriage Rides: 10:00 a.m.-3:00 p.m. – Catch a ride on a real horse-drawn carriage and sit back while taking in breathtaking views of the resort. Holiday Mixology Class: 5:00 p.m.-6:00 p.m. – Featuring the resort’s own own Bobby the Bartender, sharing twists on favorite holiday cocktails. Sampling Encouraged. Must be 21 to participate. Ugly Sweater Decorating: 11 a.m.-3:00 p.m., $15 each. Just in time for the December 31 dance party, join in decorating UGLY SWEATERS.Includes one youth crewneck sweater, plus all the decoration trimming to personalize it. Monday, December 25, 5:00 p.m. to 10:00 p.m.
At the Living Desert Zoo and Gardens through December 24 from 6pm - 9pm is the Wildlights. Lights take over the zoo and cover just about everything that will stand still. Over a million lights celebrate the holiday season. Admission to the Zoo will get you into the light show and this is something not to miss! In the same vein of celebration is the RoboLifhts, a local sensation by Palm Springs artist Kenny Irzin Js. This is the largest residential light display in the country! This is truly a winter wonderland! Don't miss it! It's located in the Movie Colony neighborhood on 1077 E. Granvia Valmonte in Palm Springs. Lights are on from 4 pm - 9:30 pm and admission is free but donations are always accepted. 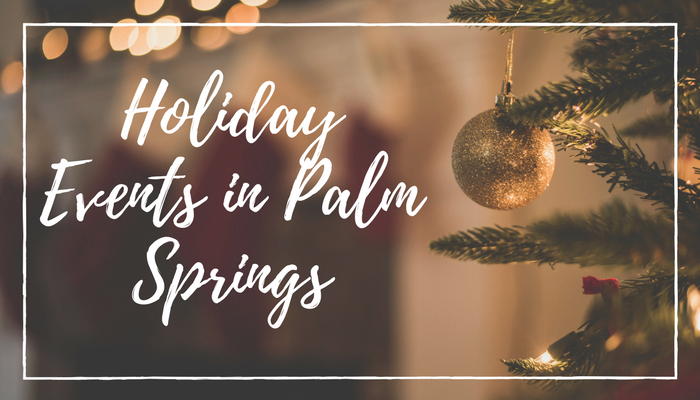 Take in all the sights on December 2 as Palm Springs offers its 25th annual festival of lights parade. Nearly 100 floats, bands, and performers will head down Palm Canyon Drive in downtown Palm Springs starting at 5:45pm. Grab a seat, your blanket, and cozy jackets and enjoy the show. December 9 and 10 is a special treat and you can come see Santa as he flies into the museum at 11 am. Kids 12 and under are free with a paying adult. There will be real snow for hours, fun, entertainment and more! We love this one! A 5K race through Las Palomas neighborhood of Palm Springs on December 16 from 9 am - 11 am.This walk benefits the Guide Dogs of the Desert and all are willing to attend with their four-legged friends or not. Online event registration is $35 per person and children ages 10 and under can partake in elf dash after the race at just $5 per runner.